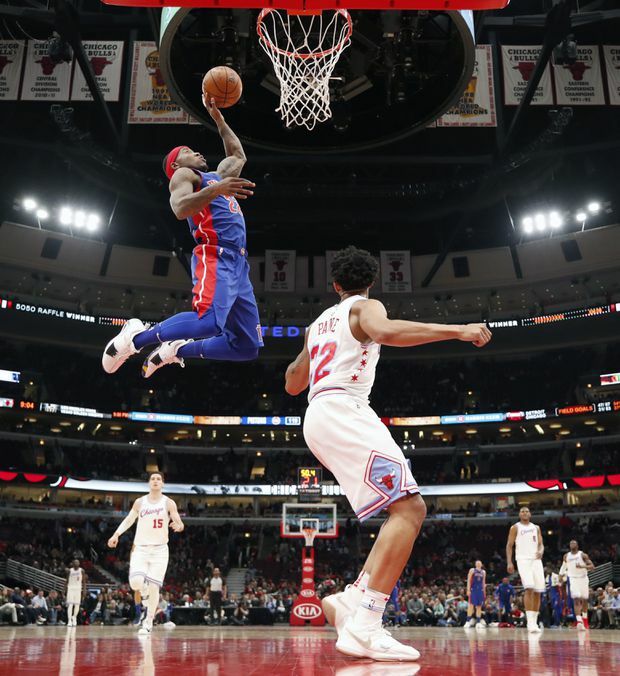 Detroit Pistons guard Kay Felder, left, goes in for a dunk against Chicago Bulls guard Cameron Payne during a game in Chicago, on April 11, 2018. The Toronto Raptors have signed guard Kay Felder to add to their backcourt depth. The 5-foot-9, 176-pound Detroit native averaged 3.6 points, 1.3 assists and 8.8 minutes in 16 games with Chicago and Detroit last season. He also appeared in 20 games with Grand Rapids in the NBA G League, posting averages of 16.8 points, 5.8 assists and 30.1 minutes. Felder has career averages of 3.8 points, 1.3 assists and 9.1 minutes in 58 NBA games with Cleveland, Chicago and Detroit. He was picked in the second round (54th overall) by Atlanta in the 2016 NBA draft. He played three collegiate seasons at Oakland, where he averaged 17.5 points, 7.8 assists and 35.9 minutes in 101 appearances.